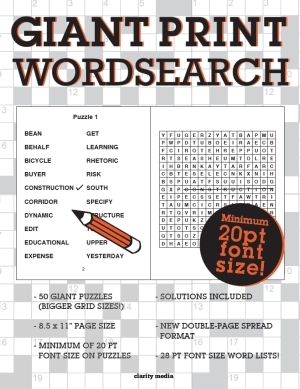 Welcome to this brilliant collection of 50 GIANT print wordsearch! Are you looking for something a little easier on the eye? Look no further! We have compiled a great mix of wordsearch puzzles that are sure to be more relaxing and enjoyable for you to solve. This edition features a new page layout format, with the word list on the left side of the spread, and a huge puzzle grid on the right. Our giant print puzzles solve just like a standard wordsearch puzzle, the only difference is that the font size is so much larger so that you can clearly read it. If you currently solve wordsearch puzzles by using a magnifying glass or other visual enhancement aid to make the print larger, we hope you will find that these large print puzzles do not enable you to use such aids, allowing you to enjoy the puzzling experience even more so than usual! 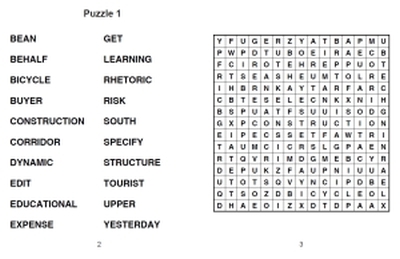 All puzzles are printed in a minimum of 20pt font size and solutions are featured towards the back of the book.